"Thousands of Flowers & Blossoms"
House of Mille de Fleur can create the perfect arrrangement for any occasion. Our staff of designers can dress up a party with flowers or brighten a loved one's day. Choose from an exquisite array of Fresh Flowers, Green & Blooming Plants, Baby Gifts, Greeting Cards, Home Decor, Silk Flowers, Candy & Chocolates, Scented Candles, Russ Berry Plush Stuffed Animals, Porcelain Vases, Musical Angels and much more. 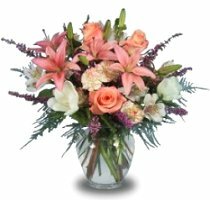 Our courteous and knowledgeable staff will design and deliver an arrangement or plant that beautifully conveys your feelings of sympathy and serves as a lovely tribute to the deceased. Planning a Wedding, Party or Other Special Event? Let our floral professionals create your unique occasion or the wedding of your dreams in flowers. Our emphasis on creativity is truly what distinguishes the House of Mille De Fleur from all the competition. We strive to serve our client's needs and tastes with the finest quality flowers and fair prices. We are proud to be creative for budgets of all sizes. We deliver daily to all area hospitals and funeral homes, down the street or around the world. Our shop is open to serve your floral and gift-giving needs: Monday through Friday 9:00 am to 5:00 pm and Saturday 9:00 am to 2:00 pm. Closed Sunday.